Once again I find myself wishing that I was better at writing reviews. As with when I wrote my review for [b:On the Island|15505346|On the Island (On the Island #1)|Tracey Garvis-Graves|http://d202m5krfqbpi5.cloudfront.net/books/1339162550s/15505346.jpg|18151286] (read it here), I felt that nothing I wrote could possibly do the book justice. I loved On the Island so much that it was probably my favourite read of 2012. And when I found out about this prequel I couldn't wait to read it, despite being a bit apprehensive that it wouldn't be about T.J. and Anna completely, but that they would feature in some way. After the first few chapters though all apprehension disappeared and I devoured this book in one sitting. I now urge everybody that read and fell in love with On the Island to stop what they are doing and read this book! I don't want to talk about the story too much as I feel that readers need to discover Owen's story for themselves. Rest assured however that it is a wonderful story, sad in parts but on the whole every bit as fantastic as T.J. and Anna's story. The idea of leaving your life behind to go and stay on an island by yourself indefinitely appeals to me, even after reading these two books! It's just the idea of escaping every day life and not having to worry about anyone but yourself that appeals. I loved reading about Owen and what made him want to do this, and reading about how he coped with life on the island. Even with the help of Mick and having trips to the mainland, it was still a struggle for Owen to adjust to life on the island. The one thing about this book was it didn't ever just feel like a fictional story. Owen's story felt so real that it almost felt like it was real. I didn't say it at the time but thinking about it the same could be said of On the Island. That too felt like a very real story, and not at all fictional. 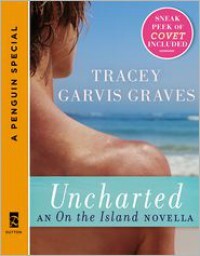 Tracey Garvis-Graves is a phenomenal storyteller to be able to create worlds, stories and characters that feel so real. I wasn't expecting to enjoy this book as much as On the Island simply for the fact that I was unsure about the premise, and because of there not being much T.J. and Anna scenes but for anybody sharing those worries, put them to one side and download this book ASAP. Just don't do it if you have to go to school/work/somewhere as you won't want to move until you reach the end of this thrilling story. It has made me want to reread On the Island and it has only been about a year since I read it for the first time. Loved the teaser for Covet too. Wish I had it available to read right now!